I arrive in Athens after a 5 hour train journey from Thessaloniki which took us through a stunning mountainous terrain. 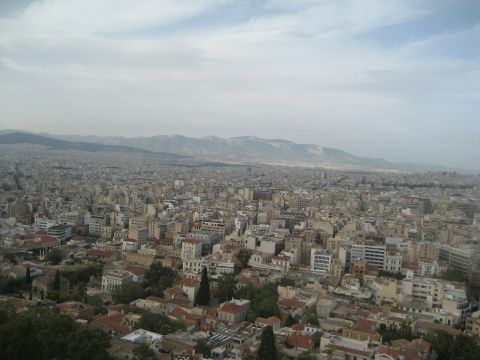 Athens is warm, it’s late September and an energetic vibe encapsulates the city. We arrive on the opening of the 4th Biennale, which is also the same day it is announced that the Golden Dawn, a far-right wing political party, are officially classified as a criminal organisation and members of the party are arrested. There’s a tense feeling on the graffiti sprawled streets and large numbers of police officers on motorcycles whiz by. The 4-day stay is framed by political and social discussions with our host. A sense of the present moment surrounds us and one cannot ignore Greece’s current situation. 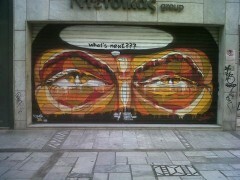 Athens feels very much at the centre of the economic and social crisis, and the effects are visible on the streets. Yet as a first timer to the city, I am quickly drawn into its charm, energy and edge. I stumble upon ancient ruins scattered through out the city alongside modern ruins, decaying buildings, broken windows and graffiti stained walls. The Parthenon still stands grand presiding over the city’s blue skies by day and as a reassuring lit up glowing presence in the skyline at night. The view from the top provides a sense of scale of the sprawling city, whilst installing a wonderful sense of peace and elevation. Back on ground level the city feels greatly divided, politically on the streets it’s become a war between the far left and the far right vying for the city’s space and attention, whilst all faith in the, often labelled ‘corrupt’ middle has turned to hatred and despair. Physically the city is divided in to safe and unsafe areas and we’re told which parts to avoid, against advice we wander through these streets which feel foreign to Greece but familiar to areas I’m used to in the UK, Asian hardware or bric-a-brac stores in run down buildings line the streets, a Chinese supermarket, groups of Pakistani men exchange conversation on the street, a wonderful Thai restaurant (we couldn’t resist a trip back to at night) and yes, we see a junkie passed out on the streets, but this is also the area where all the city’s art galleries reside. This is perhaps a strong example of cheap rents in a – labelled- ‘dodgy’ area often equal a vivid, exciting, art scene. And so, my original reason for visiting Athens is a trip to the 4th Athens Biennale (AB4). 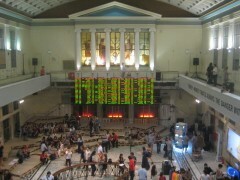 Appropriately housed largely in the city’s former stock exchange building, this years event entitled ‘Agora’ chooses to focus on not only the present situation in Greece but with eyes firmly looking into the future as it asks the question ‘what’s next’? Agora, in ancient Greek meaning a public open space for gatherings or markets reflects the Biennale’s dynamics, this year ran as a collective group of artists, curators, theorists and practitioners rather then a sole director, and the display, which was not to be a static exhibition but an evolving process of workshops, performances, collaborations and screenings, seeking audience participation as it explores new ways of thinking and imagining solutions for the economic crisis and the future of Greece. In this way the Biennale seeks to be a positive and constructive action, I admired this greatly, an ensemble of various fixed artworks span the building which put the situation in Greece into global context, but the heart of the exhibition, the agora, focusing mainly on Greece is located in the main hall. A former ‘market’ the Stock Exchange Building itself was wonderful to wander around, a building of crumbling grandeur, abandoned, and somewhat haunted by economic ghosts, the energy of the place, the decisions which would have taken place there.. the collapse.. all felt present in the building’s architecture. Likewise the private view carried an usual heightened energy, which felt more like a gathering than a traditional preview (in a good way). I will just mention one of the works that sticks in my mind and I feel encapsulates the positive spirit of AB4′s Agora. The piece by artist duo DashNDem, ‘Reaching Re-birth’, consists of a circular workstation of video monitors in which the viewer is invited to sit in front of with headphones, encountering a personal experience with the screen. The viewer works their way around the installation receiving video messages from several top international life coaches who have been specially selected to participate. Each video provides a personal message to the Greek individual, centering on the idea of self-help in the current situation, message topics include; taking responsibility, overcoming anxiety, transforming pessimism and the individual’s actions. Sometimes told with personal stories relating to Greece or events elsewhere, analogies for the situation or more directly straight forward advice, the messages are told with tact and install a sense of hope and light. After my travels in Greece and speaking to various Greeks I noticed how easy it was for people to become engulfed in the situation and to sink into a sense of the country’s despair losing perspective of the world outside. I thought how great it might be for these messages, and too the proactive actions of AB4 to be received by the public. This brings me to my final thought, as wonderful as AB4s intentions are, the buzz I felt on the opening and the aptness of the festival’s space, one niggling thought remained in my mind after leaving Athens. This was not whether the biennale would actually make any difference, as I believe that the nature of AB4’s active process is extremely important regardless of any outcome, but was the question of how much the biennale would actually be able engage with the general public of Athens, and not just the city’s artists and usual arts audience? In truth, this question hangs over most art festivals and exhibitions but feels especially crucial to the theme of AB4, and what it was trying to collectively achieve. I wondered if housing the exhibition in just two spaces in the city could be a limitation for the biennale and its potential for chance public encounters, and whether use of the city’s public space in some way would have been interesting – which, granted, is already a (no longer blank) canvas with graffiti slogans and protests.